Emma P. as Modesty B? Author unknown. One page. Reprinted from Comics Collector magazine. Peter (?) O'Donnell on the suitability of Diana Rigg for the part of Modesty Blaise. Vengeance Is Theirs: 'On the road with Steed, Purdey and Gambit'. Doug Fetherling. Two pages. Reprinted from 'a Canadian newspaper'. Canadian overview of The Avengers. A Blonde Is A New Avenger. Author unknown. Half a page. Reprinted from an unknown source (either North American or Australian). Quick overview of The New Avengers. Look, Stop Me If You've Read This, But... Graham P. Williams. Two pages. Regular opinion column. Exit The Avengers. David Tanner. Two and a half pages. Details the Season Four tag scenes. Be Seeing You. Author unknown (could be from a later issue of En Garde). Three pages. Fanfic detailing hypothetical meeting of The Avengers and The Prisoner. Time Out! Gordon Donaldson. Three pages. Reprinted from TV Guide (Canada). 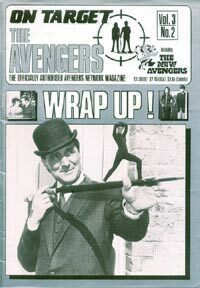 A contemporary look at the filming of the Canadian New Avengers episodes. Karate Couture. Author unknown. Three pages. Reprinted from New Zealand TV Weekly. Review of the Alun Hughes Avengers fashion show. Now Mr McSteed Shows His McKnees. Author unknown. One page. Reprinted from TV World. A look at the fashions in the episode Castle De'Ath (and at what a Scotsman wears under his kilt). A Review of The Avengers Stage Show. Paul A. Thomas. Three Pages. Also includes excerpts from some press reviews. Macnee On Wogan. Four pages. Transcribed by Richard Hoare. Transcription of Macnee interview from Wogan TV show of 25/2/83.